Common Snakes of Ohio: There are over 25 different snake species found in Ohio and out of those, three of them are said to be venomous. With steep valleys, rugged hills, big lakes, long rivers, isolated islands and drainage basins, the state has plenty to offer the average snake looking to snack on water-dwelling creatures such as frogs, toads and even newts and salamanders. Also known as the timber rattler, this snake usually measures in between 35 and 55 inches in length, a yellow or brown coloration with black or brown bands going from one side to the other across the back. 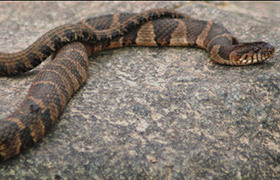 The second venomous snake of Ohio is also a rattlesnake but this time, the Eastern Massassauga Rattlesnake, a slightly smaller species measuring just 20-30 inches in length. 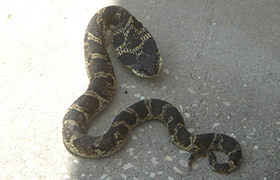 A darker color than the timber rattlesnake, this one is usually a brown-gray color with darker almost bow-shaped patches running down the length of its back. You’ll find this snake commonly in the northern parts of the state, and also along the color, glaciated areas to the west. Around the same size as the Massassauga rattlesnake, the northern copperhead (25 - 36 inches) is a pit viper that is often referred to as the copperhead snake. Common Watersnake: A slightly longer snake growing to around 40-45 inches maxmimum, this black, grey, brown or dark red / brown snake gets darker in color the older it gets, and usually has a much lighter underbelly although patterns will vary across the state. Rat Snakes: Both the black and gray rat snakes can be found in Ohio, and these feed on things such as lizards, mice, rats, copperhead snakes (venomous) and more. These rat snakes are actually very good in keeping the numbers of dangerous snakes down (and away from residential areas) as well as keeping rodent numbers down too. Eastern Hognose: The hognose snake earned its name because of the shape of its nose. This snake enjoys eating toads and in order to enjoy its prey, it needs to dig them up from within the moist soil around water. A relatively small snake, the eastern hognose only grows to about 20-30 inches in length, and you’ll find it in most areas of Ohio, most prolifically in the northwest, central and southern regions. 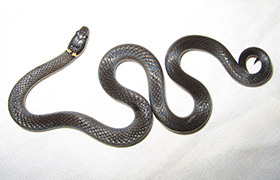 Northern Ring-Necked: Black, grey, olive or brown in color with a yellow neck-ring just as the name hints at, the belly of this snake will either be a cream / off-white color, or an orange / yellow shade. One of the smallest common snakes of Ohio, it’ll only grow to a maximum length of about 15 inches, commonly spotted in the borders of Lake Erie along with east, south and central Ohio. Garter Snakes: Plains Garter Snake - Its cousin, the Eastern Garter Snake, is more popular in other states but in Ohio, the plains garter snake is a popular one, along with the Butler’s Garter Snake. Found mostly in the north-west regions, Butler’s garter snakes (and garter snakes in general) live in moist and quite open, grassy areas such as marshes, wet prairies, and meadows, but will happily move into more suburban areas with vacant grassy lots or unkempt gardens. Their main source of food is earthworms, often bringing them to back yards, but they’ll also eat frogs, toads and salamanders. 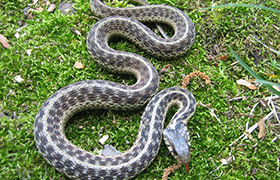 Butler’s garter snake is classed as an endangered species in the state of Indiana. You may also see the Short-Headed Garter Snake in Ohio. Another of the relatively small common snakes of Ohio, the queensnake only grows to a maximum length of around 25 inches and is a pretty uninteresting looking reptile, usually a black, dark brown or greens-brown one-tone color. Located across the whole of Ohio, you might spot this snake in your back yard particularly in long grasses where it is very well camouflaged. Similar in size to the common watersnake is the Lake Erie watersnake, a slightly thicker species with more of a green tinge than a brown one. You may even notice tinges of pink in the lengthways running patterns and formations. As the name suggests, this snake is generally only found in the islands that dot around Lake Erie. 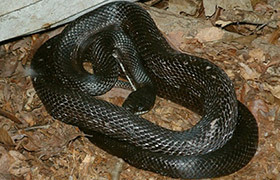 Other common snakes of Ohio include the Copper Belly Watersnake, a black or dark brown / black snake with a red or slightly orange belly commonly found around the Williams County area. A much smaller snake, the Kirkland’s snake is only about 15 inches long and has large spot-like markings, often with bright colors on the underbelly such as bright orange. Very common in places such as Hamilton and Lucas, it’s a pretty common snake that can be found across most of the state. Another teeny-tiny snake only measuring up to ten inches, the grey / brown snake with four vertically running stripes really is nothing to worry about, more often than not missed because of its small size and speed. You’ll find the Eastern Wormsnake and the Midwestern Wormsnake in Ohio, more tiny snakes that only grow to about 10 or 11 inches, quite dark-colored snakes although the eastern variety tends to be more pinky-red than it’s midwestern cousin. You’ll find these in the more southerly places of the state. You’ll find the Midland Brownsnake and the Northern Brownsnake in Ohio, easily distinguishable from their brown and dark marks situated on the sides of the snake’s head. Growing to around 13 inches maximum, these non-venomous snakes are harmless to humans when left alone.